Simpsons fans, rejoice! The world’s first Simpsons themed environment is now open at Universal Orlando Resort. 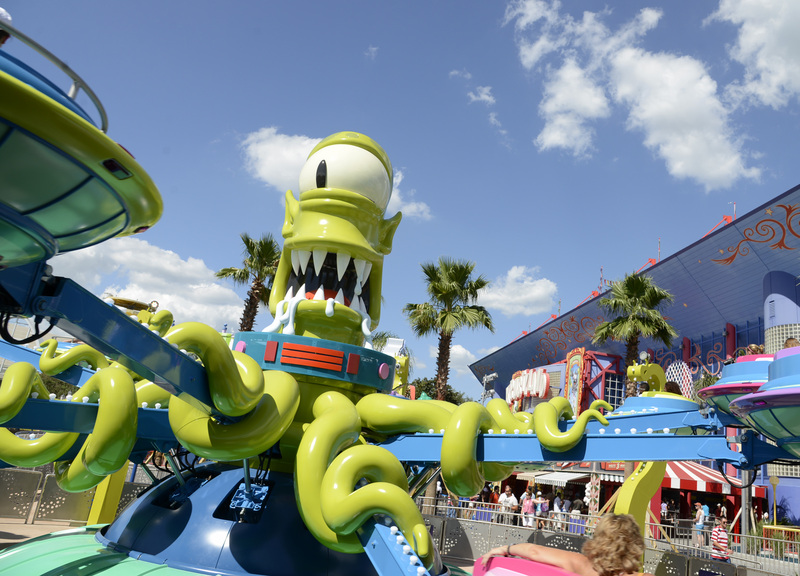 Springfield – the expansive, new area in Universal Studios Florida – invites guests to step inside the hometown of America’s favourite animated family, The Simpsons, like never before. For the first time ever, guests can enter downtown Springfield and visit the places that helped the town stake its claim as “Shelbyville by the Sea.” Anchored by the mega-attraction, The Simpsons Ride, the newly-themed area includes iconic eateries and knick-knack nooks from the hit animated series, The Simpsons, and an all-new outdoor attraction based on the show’s “evil” alien duo, Kang & Kodos. Guests may even run into Chief Wiggum (if he doesn’t run into them first). Fans who love both The Simpsons and the ride at Universal Orlando will now be able to experience a much deeper immersion into The Simpsons world with the launch of Springfield. Now fans can become part of The Simpsons family and step inside the same places Homer and his family visit on a regular basis. The longest-running scripted show in television history, The Simpsons exploded into a cultural phenomenon in 1990 and has remained one of the most ground-breaking and innovative entertainment franchises, recognisable throughout the world. Currently in production on its record-annihilating 25th season, The Simpsons has won 28 Emmy Awards and been nominated for an Academy Award in 2012 for the theatrical short The Longest Daycare. The Simpsons: Tapped Out is a top grossing mobile App and has ranked number one around the world on the App Store™ charts. The Simpsons Movie grossed over $525M at the global box office and the revolutionary virtual coaster ride at Universal Studios in Orlando and Hollywood is a continuous hit. The Simpsons received a Star on The Hollywood Walk of Fame in 2000 and has been honoured with five U.S. postal stamps personally designed by Matt Groening. Named the “Best Show of the 20th Century” by Time Magazine, in 2013 Entertainment Weekly named The Simpsons the Greatest American Sitcom. There are many ways to enjoy your Orlando holiday, but there is only one place where holiday becomes adventure: Universal Orlando Resort. It is a unique destination featuring two theme parks, Universal Studios Florida and Universal’s Islands of Adventure, three magnificently themed on-site hotels and a night-time entertainment complex. It’s the only Orlando destination where you are not just entertained – you become part of the most exhilarating entertainment ever created. You can soar above Hogwarts with Harry Potter, swing above the streets with Spider-Man, battle aliens alongside Agent J, and help Shrek save Princess Fiona in Shrek 4-D.